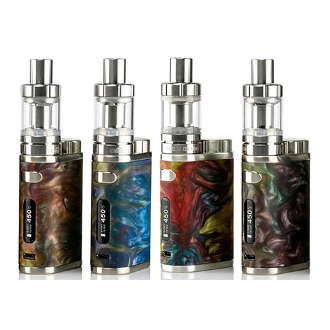 The istick pico mod Resin is an upgraded and versatile kit that allows the usage of 18650 batteries. This new style of the Pico Resin gives you a swirl of color. Each design is uniquely different in appearance but holds the same colors. It's a very smart Device with a maximum output of 75 watts and supports the usage of nickel, titanium, and stainless steel for its TCR Temperature control mode. The device itself is smaller than most 75watt e cigarettes, but packs all the specs to run in the big leagues.